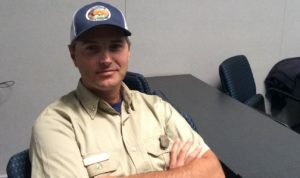 A San Luis Obispo County man who was serving as the battalion chief of a Santa Maria-based national forest firefighting agency died Thursday morning in a crash on Highway 41 in Kings County. Gary Helming, 47, was returning from a fire in the Sierra National Forest. Around 8:25 a.m., a 2000 Ford F350 was traveling northbound on Highway 41 south of Highway 33 when its left front tire suddenly deflated, according to the CHP. The truck veered to the left and into the path of Helming’s 2014 Ford F350, which was traveling southbound on Highway 41. The two trucks collided head-on, causing Helming to suffer fatal injuries. The driver whose tire deflated suffered major injuries and was airlifted to the hospital. An investigation into the crash is ongoing. Neither drugs nor alcohol appears to be factors in the collision. Helming, who reportedly lived in the Five Cities Area, was the Santa Lucia District battalion chief for the Los Padres National Forest. Helming leaves behind a wife and three kids.